What trends were established in the mobile advertising arena during 2014? 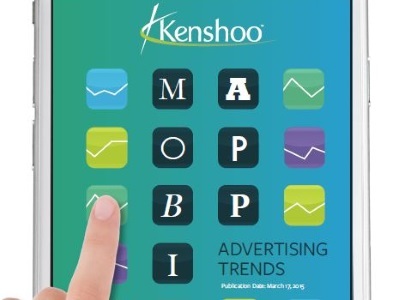 Kenshoo, a Facebook Marketing Partner, has the answers in its latest report. The volume of application installs kept steady with the growth of category ad spend over the second half of 2014, keeping cost per install relatively stable. iOS was the more costly operating system, as impressions, clicks and app installs were all more expensive than on Android. Android users were more likely to click on mobile app ads, but iOS users were more likely to install apps after clicking. Games drew higher per-unit prices and lower engagement than consumer or ecommerce apps. Paid social spend for mobile app advertisers peaked in November and rose 234 percent over the course of 2014, while the cost of mobile app installs only rose 19 percent. Cost per install was relatively stable across both iOS and Android, with the latter at less than one-half of the former. Games commanded the highest unit costs. Ads that specifically targeted large English-speaking countries were costlier. Click-through rates for mobile app ads fell steadily throughout the year before a slight rebound in the last few months. Android attracted higher CTRs than iOS, and consumer and ecommerce apps outperformed gaming apps in the metric. Marketers should continue to increase spend while the trend toward steady CPIs continues, as long as you are able to maintain ROI (return on investment) above critical thresholds. Furthermore, ensure that you are measuring post-install conversions and other in-app actions, measuring across all key performance indicators and understanding user lifetime value. Click-to-install rates increasing likely signals better targeting both on the publisher side and the advertiser side, and such targeting will be critical for advertisers to continue to enjoy stable CPIs as competition continues to heat up. Continue to hone your targeting to get as granular as possible and to ensure that you are segmenting your custom audiences well, like “VIP depositors over the last 60 days,” while leveraging expanded reach through lookalike audiences. With lookalikes, it’s critical to use a strategy of nesting targeted and excluded lookalike audiences by similarity thresholds, so that there are no overlapping lookalike audiences and they are as granular as possible. Advertisers should target separately by OS, Android versus iOS, to optimize toward differences in CPC, CPI, CTR and install rates on the two platforms. Target your campaigns separately at a minimum by language, breaking the U.S. out from other English-speaking countries. Better yet, target each country separately to ensure that you are maximizing your bids and budget most effectively in the face of country-level differences.